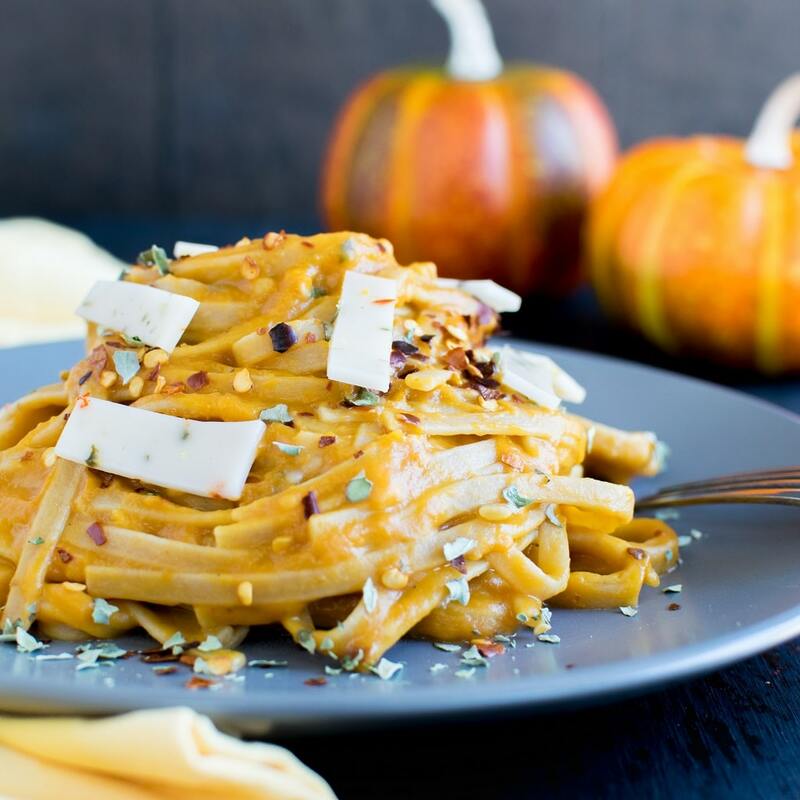 Vegan Pepper Jack Pumpkin Fettuccine is made with the goodness of pumpkin and vegan flavored cheese and folded in with fettuccine pasta. However, gluten free fettuccine goes well in this recipe too. I am personally fond of pasta to the extent that I can eat 3 meals of it all 7 days. It sounds crazy, I know, but I am super crazy for any type of pasta. I am sure, many of you look for a variety of sauce for your pasta just like me. It’s very natural because lot of times it gets boring eating the same pasta in the same style. Occasionally, we all need a change in our menu and food items. Since it is fall and pumpkins have already flooded the market I decided to do a pasta recipe with pumpkin as the main ingredient. 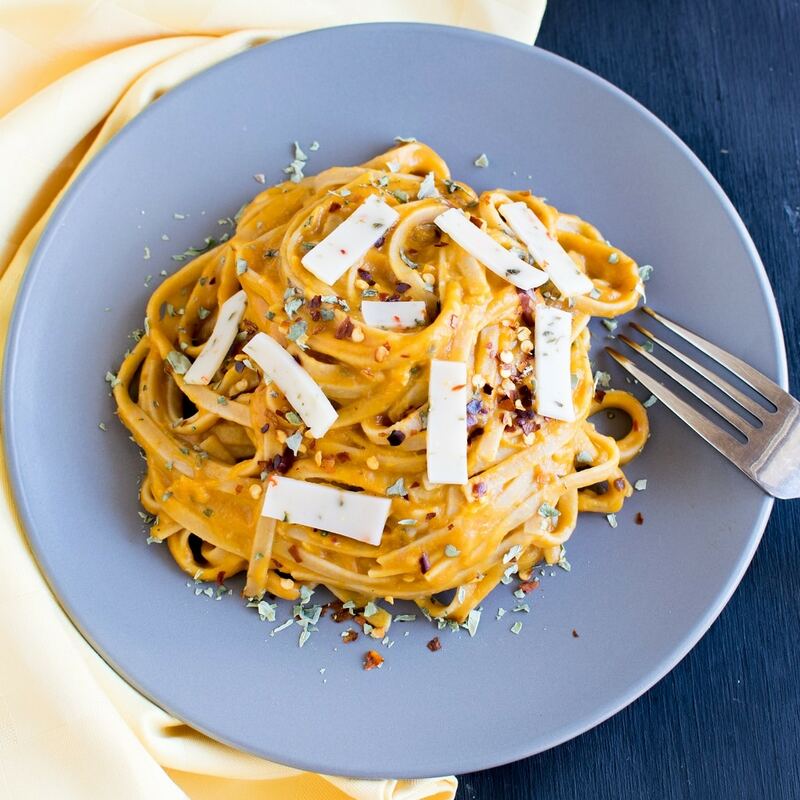 There might be many pumpkin pasta recipes flowing all over internet but I am sure you have never tasted anything like Vegan Pepper Jack Pumpkin Fettuccine. It’s not the regular mac and cheese and neither is it regular pasta sauce. The flavors of this pasta recipe are outstanding and something that your taste buds would want over and over again. The best part of this recipe is that it is oil free. For this, I heated a nonstick pan and added pumpkin puree along with garlic and crushed peppers. Afterwards, I added some vegetable broth and cooked the pumpkin puree for few minutes. Thereafter, I folded in pieces of vegan pepper jack cheese. Then, I added some unsweetened coconut milk and salt. Lastly, I tossed in fettuccine and devoured this outstanding pasta for my dinner. Before I turned into vegan diet I used to love pepper jack cheese. It’s been a while I have been missing the cheese and I was not in the mood to make my own cheese. Recently while walking through the store I found this amazing vegan pepper jack cheese and I immediately fell in love with it. I have cooked few recipes with this wonderful cheese and it taste delicious. I finally found my favorite vegan pepper jack cheese that makes my food tastier. Now, I am a happier pasta eater without missing on cheese. 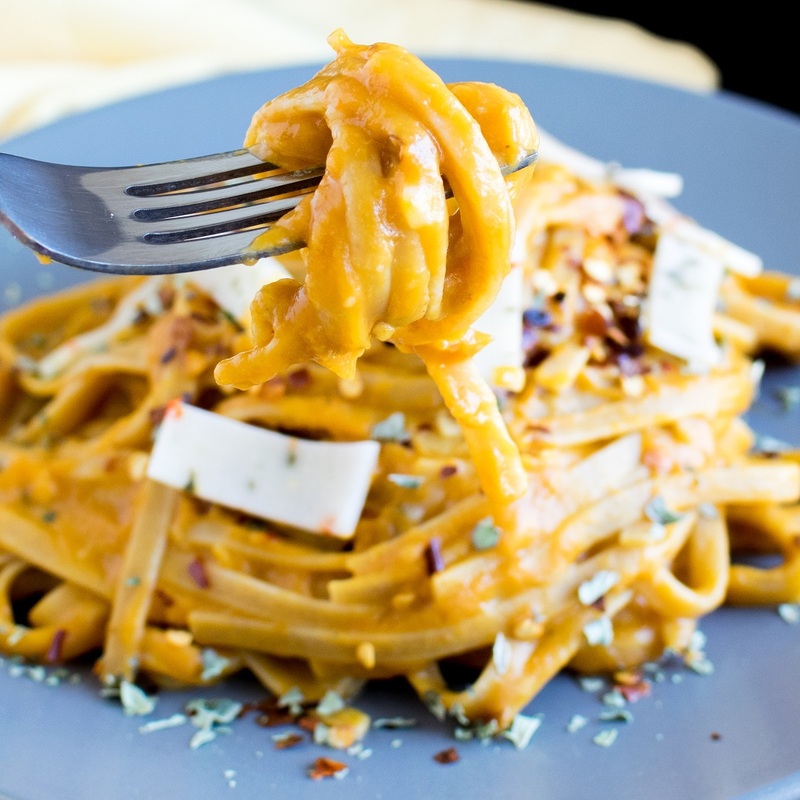 I would genuinely recommend you to cook this Vegan Pepper Jack Pumpkin Fettuccine. Its delectable and satisfying as well as a perfect savory fall recipe. Heat a pan/wok and add pumpkin puree, garlic and crushed chili flakes. Sautee and pour in vegetable broth. Mix well. Fold in chopped vegan pepper jack cheese and cook covered on a low flame until the cheese melts. (It won’t be stretchy but will melt nicely like curdled cheese). Now, add coconut milk and salt. Cook uncovered for 30 seconds and fold in boiled fettuccine. Turn off the flame and serve warm. Vegan pepper jack cheese will give a spicy blend to this recipe so if cooking for kids you may avoid the crushed chili flakes.